The curling rink on synthetic ice offered by Xtraice is one of the star products most frequently requested by our clients. What is a synthetic curling rink? While curling is becoming an increasingly popular sport, even in countries with little tradition of practicing ice sports, many people still do not know what curling is. Traditional curling is a sport played on ice which consists of sliding curling stones using specific brushes in an attempt to get them as close as possible to the central ring. Xtraice has also revolutionized the world of curling by introducing two highly attractive and innovative products. 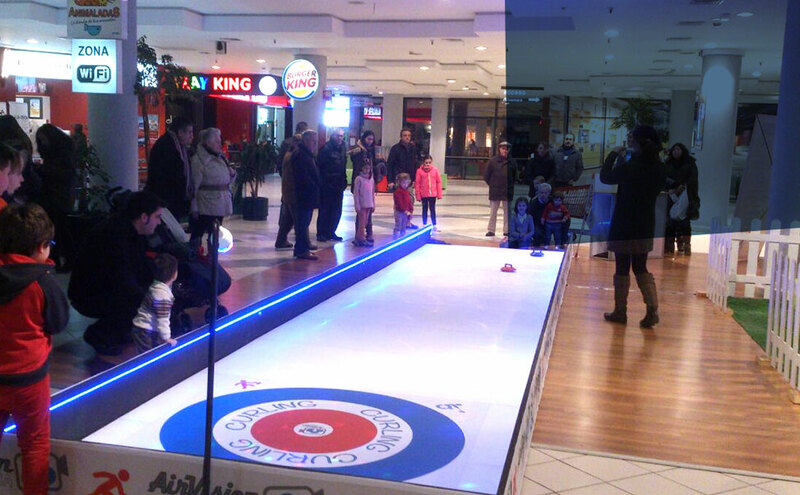 Interactive curling is a one-of-a-kind product exclusively patented by Xtraice as the sole creator. This new attraction offers a multisensory experience thanks to an interactive system based on motion sensors. The software, patented by Xtraice, projects the curling rings onto the surface, starting the game with a considerable visual impact. 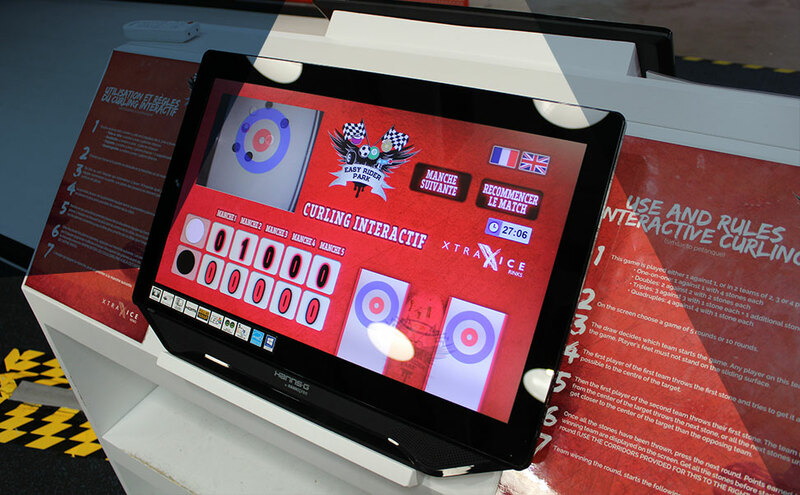 Then the players shoot their curling stones and the system automatically keeps track of points on the touchscreen which shows the position of each stone over the ring. This product, which can include as many lanes as necessary, has already successfully been tested in different locations: leisure centers, theme parks, shopping malls and even sports bars. 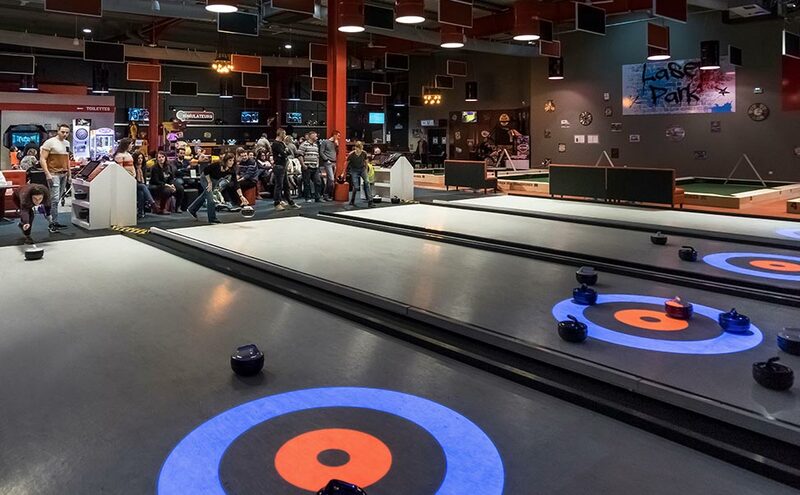 With high user participation rates, interactive curling becomes the center of attention at any facility. The return on investment is guaranteed after only a few months! Are you up for the interactive curling challenge? The other alternative Xtraice offers are synthetic ice curling sheets with the curling rings embedded in the surface of the ice. Thanks to our numerical control technology, Xtraice has been able to add the curling rings to the panels, which are manufactured with the same exclusive material. The markings are embedded in the surface of the synthetic ice securely and precisely, thus maintaining the surface’s natural gliding characteristics. Our curling surfaces always include as many stones as you need. 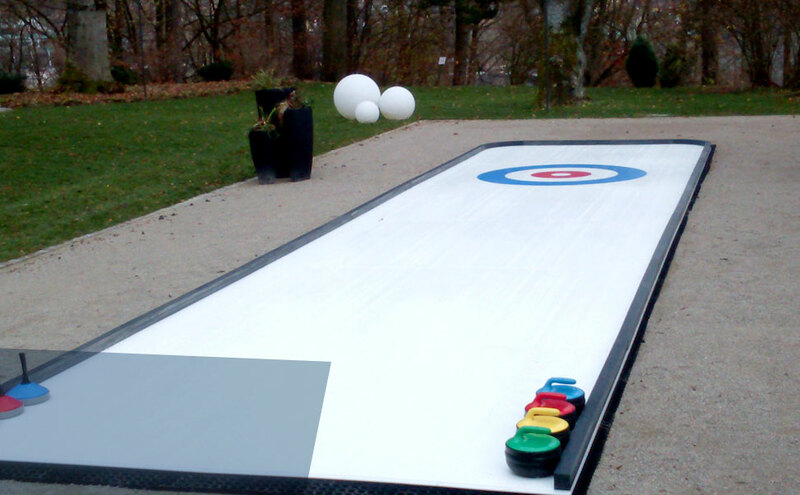 Want to get into curling with our synthetic ice curling?